Starting with the 1711 release of the SAP Hybris Marketing, Mobile Channel solution is enhanced with Apple Wallet and Android Pay integration. The graphic below illustrates the end-to-end process flow of the enhanced Mobile Channel solution. 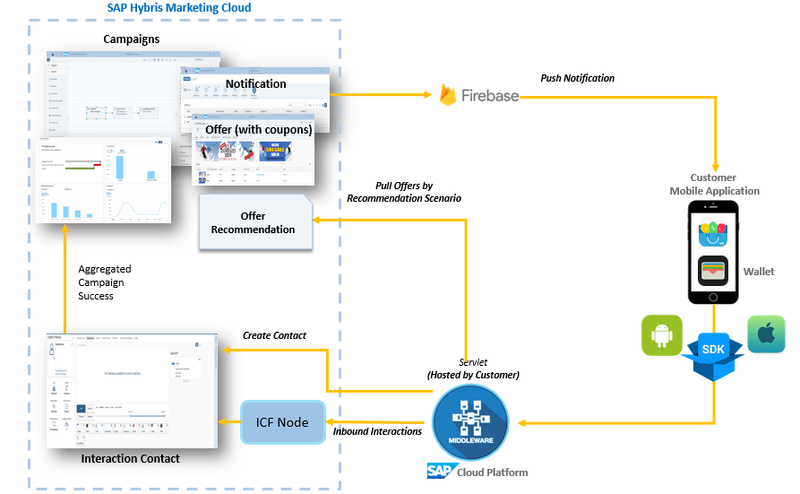 As a marketer, you can associate the coupon that you created with an offer, in turn associate this offer to a campaign, and then send these offers and notifications to the mobile app via push notifications (on the SAP Hybris Marketing end). As an end user, you can now save these offers (with coupons) in the push notification links to either an Apple Wallet or Android Pay application on to your mobile device to redeem these offers. Hope you enjoy these enhancements in our Mobile Channel solution!